Watch the teaser of GMA Network's newest primetime teleserye titled "Kahit Nasaan Ka Man" starring the newest love team - Julie Anne San Jose and Kristoffer Martin. 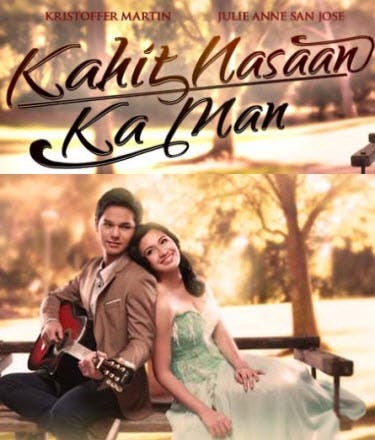 Upcoming primetime soap “Kahit Nasaan Ka Man” starring Julie Anne San Jose and Kristoffer Martin is set to replace the top-rating “Anna Karenina” this Monday, September 23, 2013. Also starring in the new series are Lucho Ayala, Miggs Cuaderno, Yayo Aguila, Tessie Tomas, Rita Avila, Ronaldo Valdez, Roseanne Magat, Rio Locsin, Epi Quizon, Eula Valdez and Michael de Mesa. flop na palabas na naman haha..mabilis matapos para nga naman di obvious pag mababa ratings..paepek na lang yang extention pag maganda feedback..pero wala naman tiwala sa palabas hahahaha.. According to one not-so-reliable source this drama will last for only a little less than 10 weeks but can be extended by means of very good audience feedback. mukhang aabante na naman sa rating ang GMA, buti naman! go go go! Julie Anne’s character – Yonna ng THAT WINTER THE WIND BLOWS ang peg!